Mendeleev explanation that properties of the elements are periodic function of their atomic weights. Moseley (1913) according to this law physical & chemical properties of the elements are periodic functions of their atomic numbers. Elements of group 1 (Alkali metals) with ns2 outermost electronic configuration. · These are all reactive metals with low ionisation enthalpies. · They lose electrons rapidly to form +1 & +2 ions. · Metallic character and reactivity increases on going down the group. These elements belong to group no. 13 to 18. · These with s – block elements are called representative elements. · Outermost electronic configuration is varies from ns2 np1 to ns2 np6. · Element of group 18 (ns2 np6) are known as noble gases or invert gases. · Elements of group 17 known as halogens and elements of group 16 known as chalcogens. · Group 16 & 17 elements have high -ve electron in their outermost shell to attain stable inert gas configuration. · Non-metallic character increase on moving left to right in period and metallic character increases on moving down in the group. These are elements of group no. 3 to 12 in centres of periodic table. Also known as the transition elements. · Zn , cd , Hg with configuration (n-1)d10 ns2 do not show most of the properties of transition elements. These have 2 – rows of elements at bottom of periodic table. i.e. lanthanides Ce (z = 58) to Lu (z = 71) Actinides Th (z = 90) to Lr (z = 103) . · Outer electronic configuration =(n-2) f1-14(n-1) d0-1 ns2. · f – block elements also known as inner transition elements. These are more than 78% of all known elements. And present in the left side of periodic table. · This have high melting points . · These are metallic (can be flattened into thin sheet by hammer) and ductile (can be drawn into winner). These present in the top right hand side of periodic table. · These are usually gases or solids at room temp. With low melting points & boiling points Boron (B) & Carbon (C) are exception. · Most of non – metallic solids are brittle and neither malleable not ductile. · Metallic character increases down in the group. · Non – metallic character increases from left to right in a period. Elements which show character of both i.e. metals and non – metals are known as metalloids or semi-metals. Ex: – silicon, germanium, arsenic, antimony, tellurium. · “Atomic radius decreases with increases in atomic no. in a period” because within the period, the outermost electrons are within the same valence shell. Also effective nuclear charge increases with increase in atomic no. results in increased attraction force between nucleus and outer electrons . · “Atomic radius increases with increase in atomic no. in a group” because of filling of inner orbital’s with electrons which serve to shield the outer electron from the attraction of nucleus, so size of atom increases. On general, the trend of ionic radius is same as that of atomic radius. · In ions lose of gain of electron takes place while no charge in nuclear charge. · Size of cation (A+) is smaller than its parent atom due to loss of electron. · Size of anion (A–) is large than its parent atom due to gain of electron. Quantitative measure of tendency of an element to loose electron is known as ionization enthalpy. · Ionization enthalpy is always +ve. · 2nd ionization enthalpy is higher than 1st ionization enthalpy. 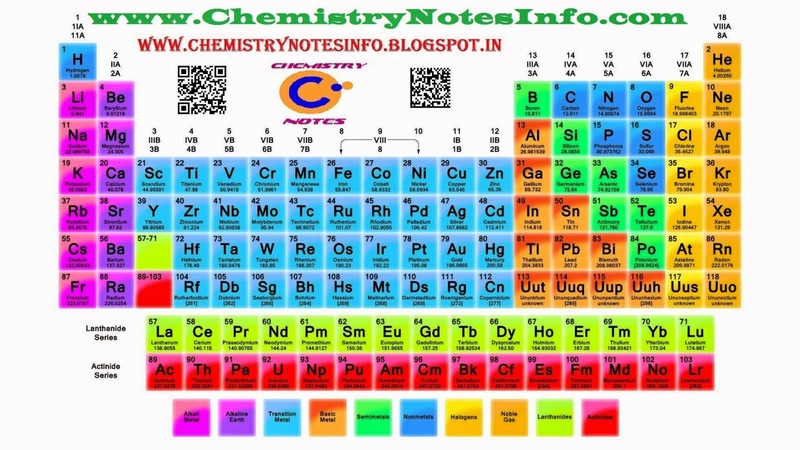 · Alkali metals have lowest and noble gases have highest ionization energy. · Ionization enthalpy increases on going left to right in a period. · And decreases on Moring downwards in a group. When an electron is added to a neutral gaseous atom to convert it into a – ve ion, the change in enthalpy in the process is given by electron gain enthalpy. It may be exothermic or endothermic reaction. · Halogens show exothermic reaction & have height – ve electron gain enthalpy. · Noble gases show endothermic reactions & have lowest +ve electron gain enthalpy. The qualitative measure of ability of atom to attract shared electrons from chemical compound (or chemical bond) toward itself is known as electronegativity. · It generally decreases down in a group and increases in a period from left to right. The valance or oxidation state depends on outer most orbital elements electron and / or eight minus the no. of outermost electrons.